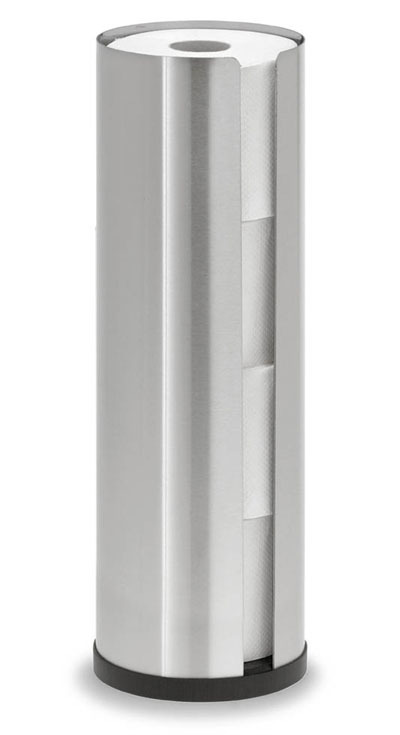 This modern toilet paper holder is part of the Blomus Nexio series. This functional free-standing toilet paper holder is the perfect fit in any bathroom with its understated classic good looks. It holds four rolls and comes with an anti-scratch base. Made from durable brushed matte stainless steel. Check out our amazing modern bathroom collection for other great bathroom accessories. Made in Germany for unsurpassed precision-made quality! The aim of Blomus is to harmonize form and function and to create special products for everyday life. By creating accessories that combine simplicity of function with the beauty of the material, Blomus has created an impressive Design catalog. Material: Brushed matte stainless steel.